A MILabs dual-energy, ultra-high resolution U-CT system has been installed at The Hebrew University of Jerusalem Israel (HUJI). Under the direction of Professor Galia Blum, this institute has established an internationally renowned research program, focused on drug design, delivery, and therapy. The Blum Lab uses synthetic chemistry methods for generating new probes that will be used for simultaneous non-invasive imaging and real-time treatment of pathologies. Most research projects in the Blum Lab combine chemical synthesis, cell biology, biochemistry, microscopy and in vivo imaging. 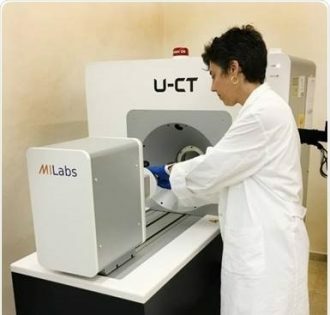 With the addition of MILabs’ latest U-CT system, the HUJI expects to further accelerate drug discoveries in several pathologies such as cancer, atherosclerosis, arthritis and autoimmune diseases. U-CT is very fast and offers ultra-high resolution scanning at low x-ray doses making it possible to handle demanding multispecies 3D/4D in vivo imaging applications, including dynamic contrast-enhanced CT imaging.